Thousands sign petition calling for removal of Minnesota Democrat. "She's Hamas' representative in the US Congress." After a campaign to oust Democratic Minnesota congresswoman Ilhan Omar from the House of Representatives signed up thousands of backers across the US, a pro-Israel Evangelical leader has accused Omar of effectively representing the Hamas terrorist organization. 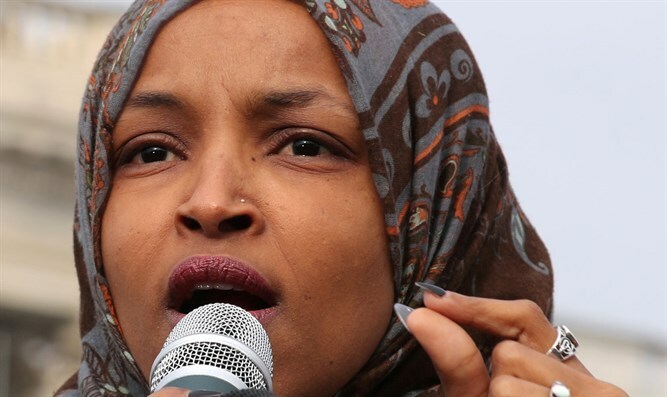 “Ilhan Omar covertly represents Hamas in the U.S. Congress, we need to act now before this blows up in our faces,” said Laurie Cardoza-Moore, head of the Franklin, Tennessee-based group Proclaiming Justice To the Nations (PJTN). Omar has come under fire for a series of anti-Israel comments critics say echo traditional anti-Semitic canards. Both Republicans and congressional Democrats hit Omar after she suggested that fellow lawmakers had been bought off by pro-Israeli Jewish groups. Earlier, Omar was ripped for comparing Israel to the Iranian regime, and suggesting Israel is not a democracy. In January, the freshly-minted congresswoman tried to justify a 2012 tweet accusing Israel of having “hypnotized the world”. Omar also drew criticism for endorsing the anti-Israel Boycott, Divestment, and Sanctions movement days after being elected – after having come out against BDS prior to the November election. Following the multiple controversies surrounding Omar and her comments regarding Israel, PJTN launched a petition calling for Omar’s ouster. Since the campaign was launched last week, PJTN says it has signed thousands backing Omar’s removal. On Tuesday, Cardoza-Moore compared Omar’s views to those of the Hamas terror organization, citing Omar’s support for the Council on American-Islamic Relations (CAIR), a group which has been accused of ties with Hamas and the Muslim Brotherhood.